Vividly haunting true stories are used by the Centers for Disease Control and Prevention (CDC) second bout of anti-smoking advertising, with graphic images encouraging smokers to kick the habit, or face the health consequences. The ‘Tips from Former Smokers’ campaign launched yesterday in a bid to persuade America’s 42 million smokers to quit by using real life stories from former addicts. The newest ads feature Brett, who has lost most of his teeth to gum disease; Shawn, who breathes through a hole in his neck due to throat cancer and Brian, who suffered a smoking related stroke. Felicita describes losing all of her teeth, Rose speaks out about her battle with lung cancer and Amanda explains about how smoking during pregnancy lead to her daughter being in an incubator. The adverts also include Terry, who passed away last September from cancer. 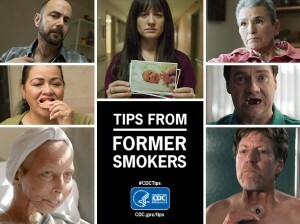 Similar ads ran throughout February, with a CDC spokesperson telling TIME that the “effort had immediate and strong impact.” During the last set of the ads’ nine-week run, they generated over 100,000 additional calls to the CDC’s quit line, with calls up by 80% while the ads were on the air. Preliminary estimates also show nearly 650,000 unique visitors to the the agency’s website during the same period. The adverts will run from 7th July, and can be seen on TV, radio, billboards, in print and also in cinemas, running alongside a social media campaign.